For smokers looking to expand beyond your basic joint, a glass pipe is usually the next purchase. But walking into a glass store for the first time, with rows upon rows of dry and water pipes of every size and shape imaginable, can be a little overwhelming. As Gage Strickland, a cashier at Piece of Mind's Valley location, tells it, pipes are incredibly customizable, so with a bit of patience and some trial and error, every smoker can find the dry or water pipe that's right for them. Strickland suggests that smokers who are new to pipes start with a small dry pipe because there isn't as much product to intake, and therefore the effect of smoking isn't as harsh. "The harshness is why a lot of people would switch to a water pipe," Strickland says. "It gives it something to filter it through, so some people can withstand it a little easier." 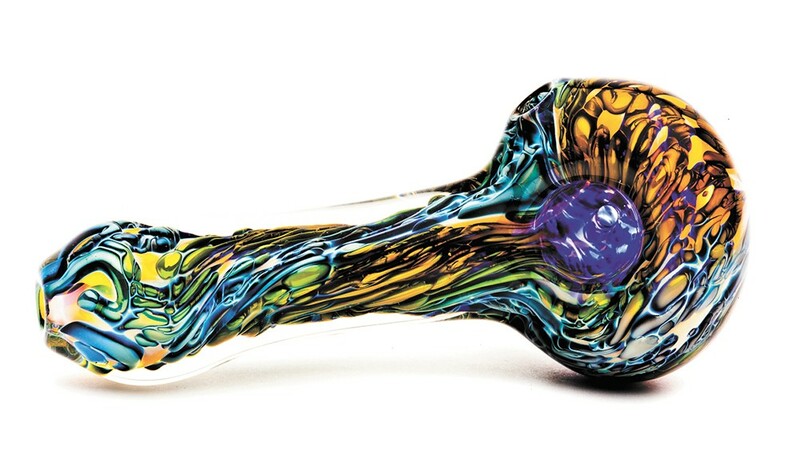 When shopping for a glass piece, take your time and really think about your personal preference; the size of the pipe, the side the carb is on, the bowl size and the size of the mouthpiece can be customized to your liking. Once you've found your ideal pipe, you need to maintain it to ensure a consistent smoke. Strickland says there are two popular routes when it comes to cleaning a glass piece: rubbing alcohol and salt, and factory-made cleaners. Both options have their downsides. "Some people don't like the granulated salt because it gets clogged a little easier and it's harder to clean out," he says. "Some people say that certain cleaners leave a taste." For those looking for a factory-made cleaner, Strickland suggests a Piece of Mind top seller from a company called Randy's. A 12-oz. bottle of the cleaner, which he says is phenomenal, goes for $10 at PoM. Finally, there's the issue of storing your brand-new pipe. Strickland says the main thing to consider is the temperature of the area in which you're keeping your piece: "You don't want to store it in a really cold area, then take it to a warm area, because like most glass, if it's a drastic temperature change, it could crack or break."